^ 原文："I was certainly aware of the gay connotations, but that was just one facet of it." ^ 原文："I hate doing the same thing again and again and again. I like to see what's happening now in music, film and theatre and incorporate all of those things." ^ 原文："escalating within a few bars from a deep, throaty rock-growl to tender, vibrant tenor, then on to a high-pitched, perfect coloratura, pure and crystalline in the upper reaches." ^ 原文："the difference between Freddie and almost all the other rock stars was that he was selling the voice." ^ 原文："His technique was astonishing. No problem of tempo, he sung with an incisive sense of rhythm, his vocal placement was very good and he was able to glide effortlessly from a register to another. He also had a great musicality. His phrasing was subtle, delicate and sweet or energetic and slamming. He was able to find the right colouring or expressive nuance for each word." ^ 原文："a performer out to tease, shock and ultimately charm his audience with various extravagant versions of himself." 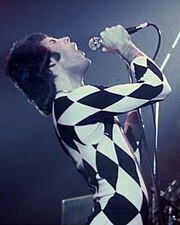 ^ 原文："Of all the more theatrical rock performers, Freddie took it further than the rest... he took it over the edge. And of course, I always admired a man who wears tights. I only saw him in concert once and as they say, he was definitely a man who could hold an audience in the palm of his hand." ^ 原文："Those who compile lists of Great Rock Frontmen and award the top spots to Mick Jagger, Robert Plant, etc all are guilty of a terrible oversight. Freddie, as evidenced by his Dionysian Live Aid performance, was easily the most godlike of them all." 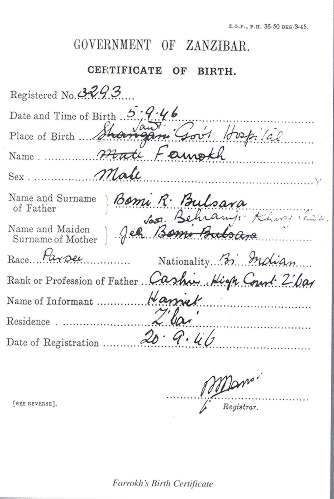 ^ Freddie Mercury (real name Farrokh Bulsara) Biography. Inout Star. [2010-07-11]. （原始内容存档于2011-08-10）. ^ Dance: Deux the fandango via Internet Archive. ^ 5.0 5.1 RollingStone.com – 100 Greatest Singers of All Time. ^ 6.0 6.1 6.2 Januszczak 1996. ^ 7.0 7.1 Fitzpatrick 2006. ^ list of Blender and MTV2's "22 Greatest Voices" (archived at www.amiannoying.com). ^ Greg, Prato. Freddie Mercury biography. AllMusic. [2011-01-24]. ^ 15.0 15.1 Jones 1998. ^ Fitzpatrick, Liam. Farrokh Bulsara. Time. 2006 [2012-04-28]. （原始内容存档于2011-05-23）. ^ The pub that hosted John lennon and Freddie Mercury needs your band... - Liverpool Echo - Jade's Music Blog. Musicblog.merseyblogs.co.uk. 2008-08-08 [2014-02-08]. ^ Queen – Greatest Hits, Vols. 1. AllMusic. [2014-09-27]. ^ 27.0 27.1 27.2 Wenner 2001. ^ 28.0 28.1 Queen 1992. ^ 34.0 34.1 34.2 34.3 34.4 Cain 2006. ^ Review: 'Bohemian Rhapsody' won't rock you, but Malek will. www.yahoo.com. [2019-02-19] （美国英语）. ^ Dr. Brian May, CBE. Guitarist. Happy birthday, Freddie Mercury. Googleblog.blogspot.com. 2011-09-04 [2014-02-09]. ^ 42.0 42.1 Harris 2005. ^ Billboard – 16 Aug 1986. Books.google.com. [2014-09-27]. ^ Rees & Crampton 1999, p. 809. ^ Teckman 2004, part 2. ^ Freddie Mercury, Mary. The Mysterious Mr Mercury (訪談者 : Midge Ure). 2011-11-12 [2011-11-12]. BBC Radio 4. ^ The Star – AIDS Kills The King of Rock. Queenarchives.com. 1991-11-25 [2011-01-09]. ^ 55.0 55.1 Hutton 1994. ^ Sweeney, Ken. Partner of Queen star Freddie buried. Irish Independent (Dublin). 2010-01-04 [2010-08-27]. ^ Do I Look Like I'm Dying Of Aids? Fumes Freddie. The Sun. 18 October 1986. ^ Kerrang! - UK - Queen, Wembley Arena London. Queen Cuttings. [2013-08-29]. ^ Webb, Julie. [Untitled interview with Freddie Mercury]. New Musical Express. 1974-03-12 [2013-09-16]. ^ Jackson, Laura. Freddie Mercury: The biography. Little, Brown Book Group. 2011-10-06: 187–190 [2013-04-09]. ISBN 978-0-7481-2907-2. ^ 69.0 69.1 Husband, Stuart. The Beach: Hedonism - LAST OF THE INTERNATIONAL; PLAYBOYS ; Pike's is a notorious Ibiza hotel where anything goes. The Independent, accessed via HighBeam Research. 2002-08-04 [2013-04-09]. （原始内容存档于2013-11-05）. ^ Jones, Lesley-Ann. Freddie Mercury: The Definitive Biography: The Definitive Biography. Hodder & Stoughton. 2011-10-13: 212 [2013-04-09]. ISBN 978-1-4447-3370-9. ^ Just months after finding out he had AIDS he threw the biggest and wildest birthday party for 700 people. The People, accessed via HighBeam Research. 1996-05-26 [2013-04-09]. （原始内容存档于2013-11-05）. ^ Millennium Series. The Entertainers' Tale (1999). Collect GB Stamps. [2011-01-09]. ^ ''We Will Rock You'' – Introduction & Credits. Ultimatequeen.co.uk. [2011-01-09]. （原始内容存档于2010-02-23）. ^ For the first time ever...Queen: Ten great hits from the sensational rock band. The Mail On Sunday. [2011-02-06]. ^ Inc, Google. Freddie Mercury Google Doodle. Video. [2011-09-05]. ABC Television, Freddie Mercury: The Tribute Concert, Sydney: Australian Broadcasting Corporation, 20 August 2007 . Aledort, And, Guitar Tacet for Queen's Bohemian Rhapsody, 29 November 2003 . "Linda B", Certificate of Birth, Chorley: mr-mercury.co.uk, 2000, （原始内容存档于2008年2月28日） . Barnes, Ken, Album Review: Queen II, Rolling Stone, 20 June 1974, （原始内容存档于2007年8月23日） . Sinatra is voice of the century, London: BBC News, 18 April 2001, （原始内容存档于2007年8月13日） . BBC reveals 100 great British heroes, London: BBC News, 2002-08-22 (22 August 2002) [2010-01-04] . Queen top UK album charts league, London: BBC News, 2005-07-04 (4 July 2005) [2010-01-04] . Queen win greatest live gig poll, London: BBC News, 2005-11-09 (9 November 2005) [2010-01-04] . Zanzibar angry over Mercury bash, London: BBC News, 2006-09-01 (1 September 2006) [2010-01-04] . 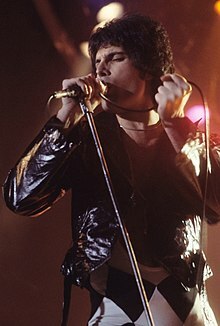 Biography Channel, Freddie Mercury, London: thebiographychannel.co.uk, 2007, （原始内容存档于2007-10-13） . Boyce, Simon, Freddie Mercury, Bristol: Parragon, 1995, ISBN 1-86105-054-2 . Queen's rhapsody voted best video, BBC News, 2007-10-08 (8 October 2007) [2010-01-04] . Middleton, Christopher, Bishton, Derek, 编, Freddie's rhapsody, The Daily Telegraph (London), 2004-08-31 [2010-05-02], （原始内容存档于2008-01-12） . Blaikie, Thomas, Camping at High Altitude, The Spectator, 7 December 1996 . Bradley, J., Mercury soars in opera CD: Bizarre album may be cult classic, The Denver Post (Denver: MNG), 20 July 1992 . Bret, David, Living On the Edge: The Freddie Mercury Story, London: Robson Books, 1996, ISBN 1-86105-256-1 . Brown, G., Queen's popularity takes ironic turn, The Denver Post (Denver: MNG), 19 April 1992 . Brown, Mark, Queen are the champions in all-time album sales chart, The Guardian (London), 16 November 2006 . Cain, Matthew, dir., Freddie Mercury: A Kind of Magic, London: British Film Institute, 2006 ..
Clarke, Ross, Freddie Mercury: A Kind of Magic, Oxted: Kingsfleet Publications, 1991, ISBN 1-874130-01-9 . Queen in Rhapsody over hit award, CNN (Atlanta), 9 May 2002 . Cohen, Scott, Queen's Freddie Mercury Shopping for an Image in London, Circus Magazine, April 1975 [2009-09-24], （原始内容存档于2007-10-11） . Coleman, Ray (编), The Man Who Would Be Queen, Melody Maker, 2 May 1981 [2009-09-24], （原始内容存档于2007-10-20） . Cota, Erich Adolfo Moncada, Queen Proves There's Life After Freddie, Seoul: Ohmynews.com, 25 January 2006 . D'Esti Miller, Sarah, EPAC's 'Rhapsody' Hits Too Many Wrong Notes, Press & Sun-Bulletin (Binghamton, NY), 19 July 2007 [2009-09-24], （原始内容存档于2011年7月15日） . Das, Lina, The Great Pretender, The Mail on Sunday (London), 2006 (26 November 2000) [2009-09-24] . Davis, Andy, Queen Before Queen, Record Collector, 1996, 3 (199) . Evans, David; Minns, David, Freddie Mercury: This is the Real Life, London: Britannia, 1992, ISBN 0-9519937-3-9 . Fitzpatrick, Liam, Farookh Bulsara, Time Magazine, Asia Edition, 60 Years of Asian Heroes (Hong Kong: Time Asia), 13 November 2006, 168 (21), （原始内容存档于2008年12月28日） . Freestone, Peter, Mister Mercury, London: Tusitala, 1998, ISBN 0-9533341-0-4 . Freestone, Peter, Freddie Mercury: An Intimate Memoir By the Man Who Knew Him Best, London: Omnibus Press, 1999, ISBN 0-7119-8674-6 . Guazzelli, Andrés E., The Voice: Freddy Mercury > Characteristics of his voice, Buenos Aires: f-mercury.com.ar, 8 February 2007, （原始内容存档于2009年4月16日） . Gunn, Jacky; Jenkins, Jim, Queen: As It Began, London: Sidgwick & Jackson, 1992, ISBN 0-330-33259-7 . Haines, Lester, We Are the Champions" voted world's fave song, The Register (London), 29 September 2005 . Harris, John, The Sins of St. Freddie, Guardian on Friday (London), 14 January 2005 . Hauptfuhrer, Fred, For A Song: The Mercury that's rising in rock is Freddie the satiny seductor of Queen, People, 5 December 1977 [2009-09-24] . Highleyman, Liz, Who was Freddie Mercury?, Seattle Gay News, 9 September 2005, 33 (36) . Hodkinson, Mark, Queen: The Early Years, London: Omnibus Press, 2004, ISBN 1-84449-012-2 . Hutton, Jim; Waspshott, Tim, Mercury and Me, London: Bloomsbury, 1994, ISBN 0-7475-1922-6 . Hutton, Jim, Freddie and Jim" A Love Story, The Guardian, "Weekend magazine", 22 October 1994, （原始内容存档于2007年10月12日） . Hyder, Rehan, Brimful of Asia: Negotiating Ethnicity on the UK Music Scene, Ashgate, 2004, ISBN 978-0-7546-4064-6 . Independent, Depp tipped for Freddie Mercury film role, The Independent (UK), December 2006 [2011-02-25] . Jackson, Laura, Mercury: The King of Queen, London: Smith Gryphon, 1997, ISBN 1-85685-132-X . "James", NTV program review: History's 100 Most Influential People: Hero Edition, Saitama: japanprobe.com, 1 April 2007, （原始内容存档于2009年10月16日） . Januszczak, Waldemar, Star of India, The Sunday Times (London), 17 November 1996 . Jones, Lesley-Ann, Freddie Mercury: The Definitive Biography, London: Coronet, 1998, ISBN 978-0-340-67209-9 . Jones, Tim, How Great Thou Art, King Freddie, Record Collector, July 1999, （原始内容存档于2009-10-25） . Landesman, Cosmo, Freddie, a Very Private Rock Star, The Times (London), 10 September 2006 [2010-05-02] . Longfellow, Matthew, dir., Classic Albums: Queen: The Making of "A Night at the Opera, Aldershot: Eagle Rock Entertainment, 21 March 2006 . Hudson, Jeffrey, Freddie Mercury & Queen, Chessington, Surrey: Castle Communications, 1995, ISBN 1-86074-040-5 . Mehar, Rakesh, God Should've Saved the Queen, The Hindu (Kochi) (New Delhi: hinduonline.com), 18 September 2006, （原始内容存档于2011年6月6日） . Mercury, Freddie; Brooks, Greg; Lupton, Simon, Freddie Mercury: A life, In His Own Words, London: Mercury Songs, 2006, ISBN 0-9553758-0-0 . Minchin, Ryan, dir., The World's Greatest Gigs, London: Initial Film & Television, 2005 . Myers, Paul, Queen star dies after Aids statement, The Guardian (London), 25 November 1991 [2010-05-02] . National AIDS Trust, 25 years of HIV – a UK perspective, London: National AIDS Trust press office, 2006, （原始内容存档于2006-12-22） . O'Donnell, Lisa, Freddie Mercury, WSSU professor were boyhood friends in India, Zanzibar, RelishNow!, 7 July 2005 [2009-09-24], （原始内容存档于2008-02-18） . Queen, Bohemian Rhapsody, Queen: Greatest Hits: Off the Record, Eastbourne/Hastings: Barnes Music Engraving, 1992, ISBN 0-86359-950-8 . Plekhanov, Sergey, A Reformer on the Throne: Sultan Qaboos Bin Said Al Said, Trident Press Ltd, 2004, ISBN 1-900724-70-7 . Prato, Greg, Freddie Mercury, AllMusic (Ann Arbor), <not dated> 请检查|date=中的日期值 (帮助). Rees, Dafydd; Crampton, Luke, Summers, David, 编, The Rock Stars Encyclopedia, London: Dorling Kindersley, 1999 . Ressner, Jeffry, Queen singer is rock's first major AIDS casualty, Rolling Stone, 9 January 1992, 621, （原始内容存档于2007年3月12日） . RIAA, Gold and Platinum Record Database, Washington: Recording Industry Association of America, 2007 . 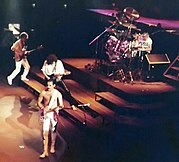 Rivadavia, Eduardo, Mr. Bad Guy (Overview), AllMusic (Ann Arbor), <not dated> 请检查|date=中的日期值 (帮助). Rush, Don, Queen's Freddie Mercury, Circus Magazine, 1977a (17 March 1977), （原始内容存档于2009-10-25） . Rush, Don, title unknown, Circus Magazine, 1977b (5 December 1977) [2009-09-24], （原始内容存档于2007-10-20） . Russell, Paul, The Gay 100: A Ranking of the Most Influential Gay Men and Lesbians, Past and Present, Seacaucus: Kensington/Citadel, 2002, ISBN 0-7582-0100-1 . Skala, Martin, Concertography > Freddie Mercury live > Early days, Plzen, Czech Republic: queenconcerts.com, 2006 . Sky, Rick, The Show Must Go On, London: Fontana, 1992, ISBN 978-0-00-637843-3 . Stothard, Peter (编), Freddie Tribute, The Times (London: Times Newspapers), 26 April 1992, （原始内容 (– Scholar search)存档于2007年10月5日） . Taraporevala, Sooni, Parsis: The Zoroastrians of India: A Photographic Journey 2nd, Woodstock/New York: Overlook Press, 2004, ISBN 1-58567-593-8 . Teckman, Kate, dir., Freddie's Loves, London: North One Television, 2004 *part 2* *part 3*. Teeman, Tim, I Couldn't Bear to See Freddie Wasting Away, The Times (London), 7 September 2006 [2010-05-02] . UK Top 40 Albums Chart 10 September 2006, UKMusic.com, 10 September 2006, （原始内容存档于2008年3月13日） . Urban, Robert, Freddie Mercury & Queen: Past, Present & Future Impressions, afterelton.com, <not dated>, （原始内容存档于2014-07-31） 请检查|date=中的日期值 (帮助). Webb, Julie, Queen, NME (London), 4 April 1974, （原始内容 (– Scholar search)存档于2007年10月20日） . Wenner, Jann, Queen, Hall of Fame Inductees, Cleveland: Rock and Roll Hall of Fame, 2001, （原始内容存档于2008-05-05） 引文格式1维护：显示－作者 (link). Wigg, David, Mercury Left Me His Millions, Daily Mail Weekend, 22 January 2000 .